Far-right politician Jair Bolsonaro has won a sweeping victory in Brazil's presidential election. The former army captain won 55.2% of the vote against 44.8% for Fernando Haddad of the left-wing Workers' Party. Mr Bolsonaro's pledge to fight crime and corruption following a string of scandals have won him mass support. However critics are worried by his praise of Brazil's former dictatorship, and by his comments on race, women and homosexuality. 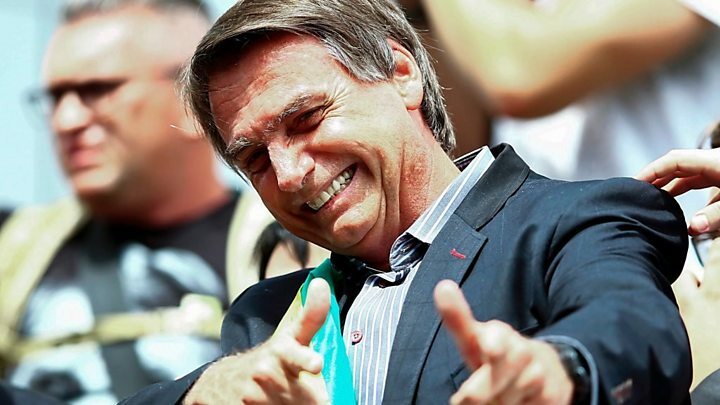 Mr Bolsonaro's controversial comments, his pro-gun stance and his populist approach to politics have led to some media dubbing him "Trump of the Tropics". President Trump himself took to Twitter on Monday to praise the Brazilian president-elect. For his supporters, Mr Bolsonaro is a politician who they say will bring much needed change to the country - a swing to the right after four elections won by the left. 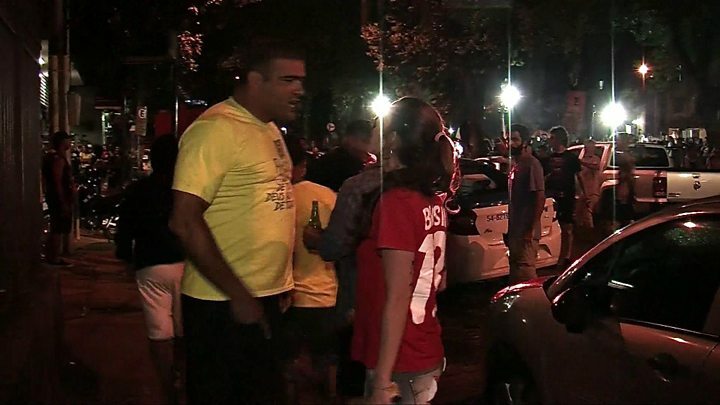 For the past four years, Brazil has been consumed by a criminal investigation - known as Operation Car Wash - that has uncovered massive corruption. Mr Bolsonaro is a deeply polarising figure who has had a divisive effect on Brazilians with both supporters and opponents taking to the streets to make their voices heard. He has in the past defended the killing of opponents to the country's former military regime and said he is "in favour of dictatorship". But after the results came in, he told supporters he would be a "defender of democracy" and uphold the constitution. One of his flagship policies is to restore security by relaxing gun laws and suggested that "every honest citizens" should be able to own a gun. Is there a chance Mr Bolsonaro could soften his stance, now he's won power? Few experts believe it. You only need to look to another firebrand in the continent for guidance. "The things that Donald Trump outlined and the signals that he gave during the campaign he carried through with," says Kyle Pope of the Columbia Journalism Review, who has studied parallels between Brazil's new president and the leader of the US. Whatever the comparison, what is clear is that country's sharp swing to the right will resonate beyond Brazil as another populist takes power. And the opposition will redouble efforts not to take away the gains that country's made since it returned to democracy 30 years ago. On the one hand, his PSL party achieved a remarkable breakthrough in this month's legislative election, increasing its representation from one to 52 seats in the lower house. However Mr Haddad's PT remains the largest party, with 56 seats. Argentine President Mauricio Macri described the poll results as Mr Bolsonaro's "triumph"
Chilean President Sebastián Piñera congratulated Brazilians for a "clean and democratic election"
Mexican outgoing President President Enrique Peña Nieto hailed Brazil's "democratic strength"
Peru's Martin Vizcarra wished Mr Bolsonaro "full success"
Venezuela's Nicolás Maduro extended his "congratulations to the people of Brazil"
Amnesty International said that taking into account his campaign pledges, Mr Bolsonaro's victory could pose a "huge risk" to Brazil's indigenous peoples, LGBT communities, black youth, women, activists and civil society organisations.